UC Merced’s first Ph.D. graduate is back on campus. But this time, Ricardo Cisneros isn’t enrolled as a student; he’s a professor instead. 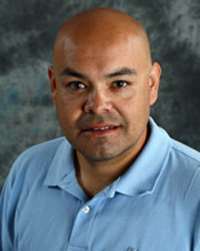 Cisneros, who earned his doctorate in Environmental Systems from the School of Engineering in 2008, was the first environmental health professor hired in the School of Social Sciences, Humanities and Arts for its public health program. Cisneros’ experience researching air quality for the U.S Forest Service, both before and after his graduate studies, and his year of working with UC Davis’ Department of Public Health Sciences as a University of California President’s Postdoctoral Fellow made him a natural choice to fulfill UC Merced’s opening in environmental health, according to Paul Brown, director of the university’s Health Sciences Research Institute. “Ricardo’s passion for making a difference in the valley, and his extensive experience with public policy, environmental science and management put him in a position to provide our students with a unique learning experience that is focused on relevant, real-world applications,” Brown said. In that vein, Cisneros is joining the HSRI’s collaborative valley fever research project. For his part, Cisneros will examine exposure to the spores causing the disease to see if infection can be prevented.